Welcome...to the Bay View Inn Motel and Marina in the Florida Keys offering affordable accommodations for daily, weekly, or monthly lodging. Our amenties include: Brand New Boat Docks for each unit! Our new docks can accommodate up to 45' boats. Boat ramp Free boat dockage Swimming pool Clean, comfortable rooms Free wireless internet connection Fishing tackle, ice, beer, bait from our convenience store Bookings for Florida Keys charter boats Unsurpassed open water sunset - sunrise views 20 minutes from Marathon, Florida Plenty of parking for vehicle and boat trailer Tiki Hut and bar-b-que area We are located on Conch Key, in the middle of the Florida Keys, as we say..."in the middle of paradise." Centrally located for the best snorkeling, diving, and sportfishing in the Keys. The Bay View Inn is a perfect vacation in the Florida Keys for fishermen, families, birdwatchers, and sports enthusiasts. We have a boat ramp, we sell gasoline, we have plenty of protected dockage, and our convenience store sells frozen bait and fishing supplies. We are a "mom and pop" inn with 10 tropically decorated units. There are various types of room rentals available: Three Keys water view hotel rooms Five waterfront efficiencies One Conch Key vacation rental house One suite One upstairs apartment Pool at this Florida Keys accommodation: Our pool has a waterfall; steps for easy in/out with a handrail. 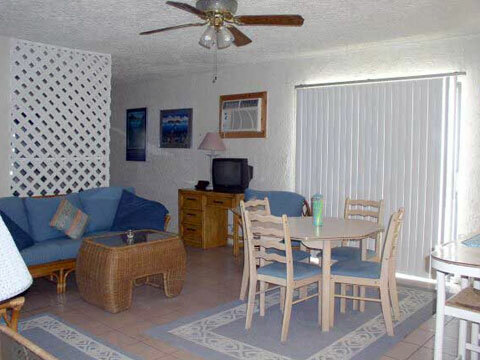 You will find plenty of beach chairs, lounge chairs, and a tiki hut with lots of room to bar-b-que on our grills. We have an open water view from the tiki hut and the pool. Nice landscaping and 3 happy swimming dolphins frame the area around the pool. Motel lodging Northern Marathon for 4 people with DSL computer connection: Our rooms are clean and will accommodate up to 4 people. Most of our rooms have small kitchens; bed and bath linens are provided. There is a coin operated washer/dryer. We have hair dryers and irons on request. Our rates in season start as low as $109.00/night. Please call about our wonder-Fall special savings! Open water view with easy access to both oceanside and bayside for fishing: The Bay View Inn is located on Florida Bay, minutes from Everglades National Park, and minutes from the oceanside by going under the Long Key Bridge. We have good fishing from our dock at night. The Long Key Bridge produces tarpon and permit. Close by are flats with black tipped sharks, snapper, grouper, and bonefish. We have tables and chairs, picnic tables, and several grills for bar-b-ques. Also, a great tiki hut with a view of the water. We have a convenience store open from 8:00 am to 7:00 pm everyday at our Florida Keys Motel and Marina! The convenience store and motel's office are located on the ground floor. We sell a large variety of beverages, frozen bait, snacks, pre-packaged sandwiches, ice, coolers, fishing supplies, boating supplies, diving supplies - and lots more. The Middle Florida Keys has lots to do that's fun: fish, boat, run on the beach! This photo was taken at Sombrero Beach. This beach is 20 minutes from the Bay View Inn and has picnic tables, restrooms, tiki huts, and wonderful sand.